I went up to Boston this weekend to see my mother and my darling little nephew. My mother was visiting my sister and her family for the week, so I got out of work early last week to get some family time. Of course, I couldn’t let an opportunity to do a race in a new location go by, so I searched for a nearby short race, like a 5K, so it wouldn’t eat up too much into family time. 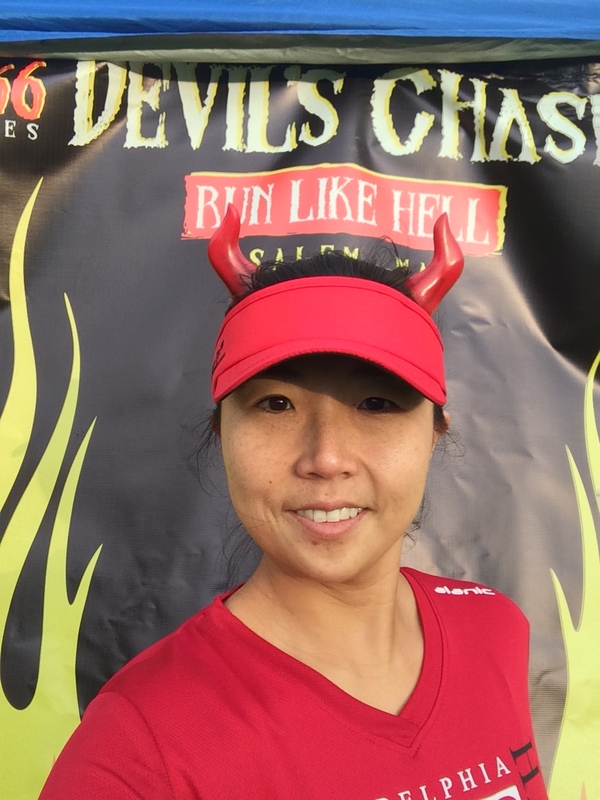 Well, as soon as I found the Devil’s Chase 6.66 in Salem, which was an hour away, I could not NOT do a devil-themed race for Halloween. It was just too cool. I purchased a little pair of devil’s horns that were nice and light and a devil’s tail to attach to the FlipBelt. The tail was neat because it had a wire, so I bent it a little so it wasn’t hanging straight down. I wanted it to be curled upright, but that wasn’t feasible. 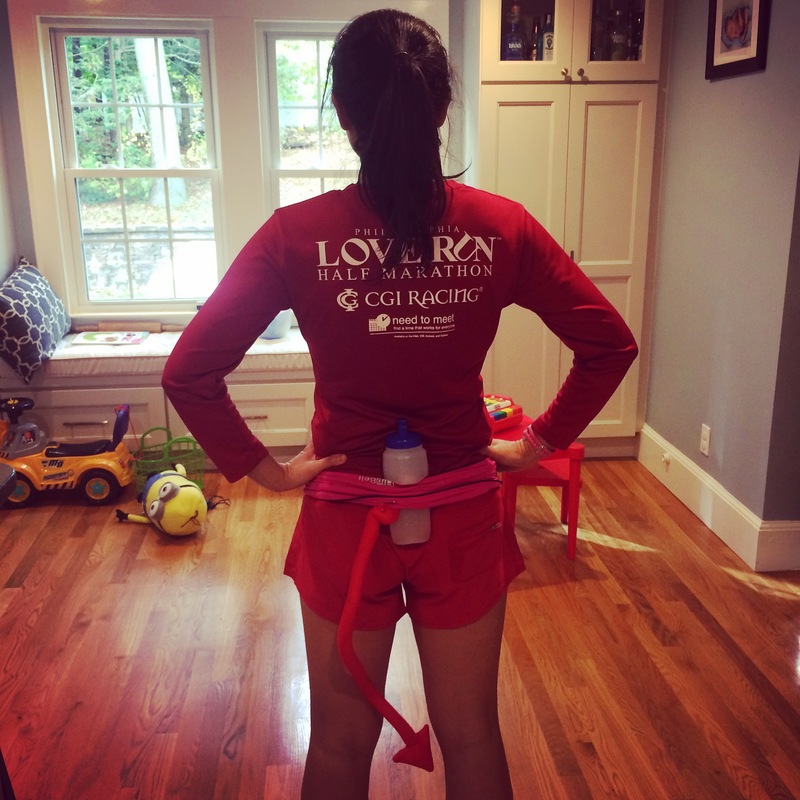 I decked myself in a completely red outfit: red tech shirt (I thought it would be ironic to run with the Philly Love Run shirt as a part of my devil costume, red Oiselle Roga shorts, and a red Headsweats visor). The course snaked around Salem and went by Salem’s famous sites: Salem Common, Peabody Essex Museum, a haunted house, the Custom House, Salem’s Derby Wharf, and the House of Seven Gables. The course kinda looked like a person and I thought it was a pity that they couldn’t figure out how to get the course to look like a devil with a tail. The distance of 6.66 is unusual (but, oh, so apropos). I decided to treat this as a 10K plus a little more. Goal was to run this at a sub-8:00 pace, closer to 7:50. The weather was nice and cool with a cloudy sky, exactly how I like it. The first mile, I took off like a rocket. The mile split was 7:32, which was way too fast, but somehow I felt confident that I wasn’t going to implode at the end, despite this. I adjusted myself to take the next mile slower. Garmin beeped me 7:52. Much better. My legs were finding their race pace and every time I glanced down at my Garmin I noticed that the time was between 7:50 and 7:59. I was happy. I settled in and concentrated on running even splits. Because of the course design of in and outs, I got to see a fair number of costumed runners. My favorite costume was the lady who ran as Devil Donald and carried a sign the entire time saying that Heaven was rigged. Toward the end I was getting fatigued, but I repeated my mantra, “You can do anything for one mile” to myself over and over again. The last half mile was painful, but I kept churning my legs. I was so happy to see the finish line. I finished in 52:02, which is a 7:49 pace. My Garmin beeped that the 10K split would have 49:04, which would have been my second fastest 10K. My 10K PR was set back in 2014. I was thrilled. I really benefit from running in cooler weather; I haven’t been racing so well and so consistently for a long while. These last two races have been nice confident boosters for all the miserable hot summer training that I did. The post-race breakfast was wonderful. Every Little Breeze Catering provided some of the food and I ate up every bite of the veggie frittata, sausage links, and the incredible pumpkin bread. The pumpkin bread was light, fluffy, and one of the best pumpkin bread that I’ve ever eaten (and I looooooovvvvveeee pumpkin bread). I also had a ton of fun running around and taking photos of costumed runners. The temperature was great for running because I never got hot, but after a half hour, I was freezing. My hands got numb. After I confirmed that I got no age group award (man, the women are FAST in the Boston area), I drove back to my sister’s. This is absolutely one of THE NEATEST RACES, especially one of the COOLEST HALLOWEEN RACES, in the United States. I had an incredible time (not just with running), but with the wonderful fun, jovial atmosphere. It was a blast. I definitely think if you’re anywhere in the New England area that you should go do this race. You’ll have ONE HELL OF A GOOD TIME!!!!!! 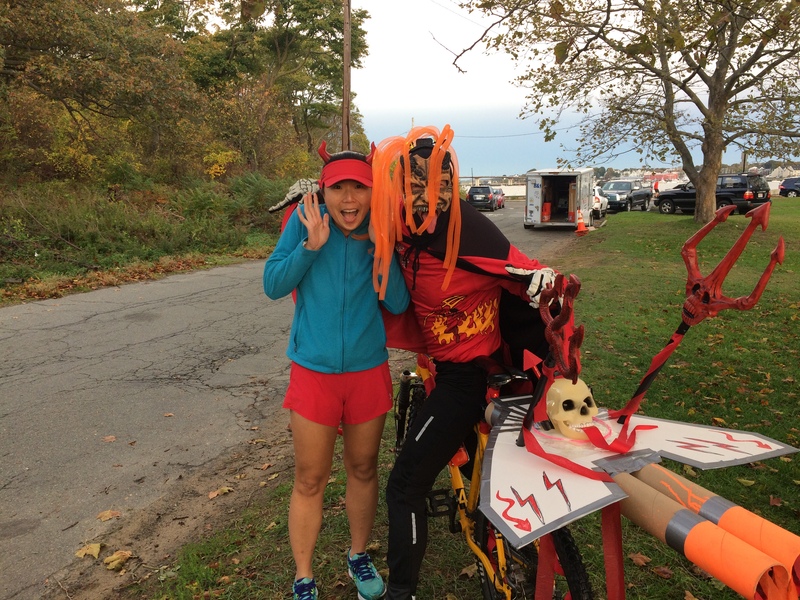 Do you ever run in costumes? What’s the best themed races that you’ve ever experienced? This sounds like a blast! So funny because I just confessed to Rock after almost 15 years together that I am very OCD and superstitious (comes from competitive skating). I put my shoes and clothes on a certain way and even dress Mary the same way. He’s never noticed. And yes, I admitted that I will do it all over if I mess up. The biggest thing he laughed at is that it drives me crazy when I look at my GPS and it is on 666. I don’t buy into the number so I don’t know why. But I always cringe! This race looks awesome though. I don’t like ending runs on anything other than a 5 or a 0 (preferably 0 because of the way Strava rounds), but this was the one time I really wanted the distance to read 6.66. This sounds like such a great run! I love gimmick runs. Wish we had something like that where I lived. I’m a sucker for cleverly-themed races. I just love this race.